Making the Most of Your Vacation Time! 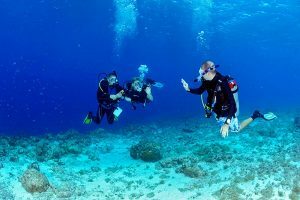 The Open Water Referral is the course component of the full certification for divers who have already completed their academic/theory and confined water skill training sessions at their local dive shop prior to arriving on island. This is a great way to get to know divers in your own community before heading to Go West Diving with your Referral Letter to complete your Open Water dives in our warm tropical environment. You will need to provide Go West Diving with a signed and dated Referral Form from your instructor indicating you have completed the classroom and pool training within the past 12 months, along with your logbook. Referrals are accepted from PADI, Universal Referral System, & Global Referral System. You must be at least 10 years old. No prior experience with scuba diving is necessary, but you need to be in reasonable physical health. Day One: You will meet with your instructor and review the paperwork and log book brought with you. Since your instructor was not part of our academic or confined water training, he or she will need to generally assess dive knowledge and assess your skills and comfort level in-water before beginning your Open Water dive skills. Once ready, you will complete your first two Open Water shore dives on our beautiful house reef. Day Two: Two down, and two to go! Enjoy two more educational and inspiring dives on the house reef refining your diving skills and building confidence. After you have completed all four „check-out“ dives, our PADI instructor will sign your Referral Forms to verify completion. You are then free to spend the rest of your vacation as a newly certified diver!